Just got back from the yearly ‘CEBIT trip’. It was the first time we represented 3CX at the worlds number one IT fair. We exhibited in Hall 13, and I joined my Colleagues Chris, Kevin from 3CX and Andreas from our distributor Ebertlang. The use of VOIP gateways rather then PCI add in cards is clearly more advantageous – people are seeing the advantages of taking the Analog/ISDN to IP conversion off the box and making the gateway independent from operating system versions. Especially in the linux area where a kernel update can effect the device drivers of the voice cards. Virtualization of the PBX seems to be well received. 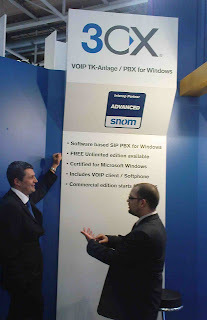 Rather then using a separate IP PBX appliance, virtualize the PBX under Vmware, or Hyper V of Windows 2008 server. Looks like you hit the nail on the head again Nick. Well done! VOIP business is indeed on a surge!